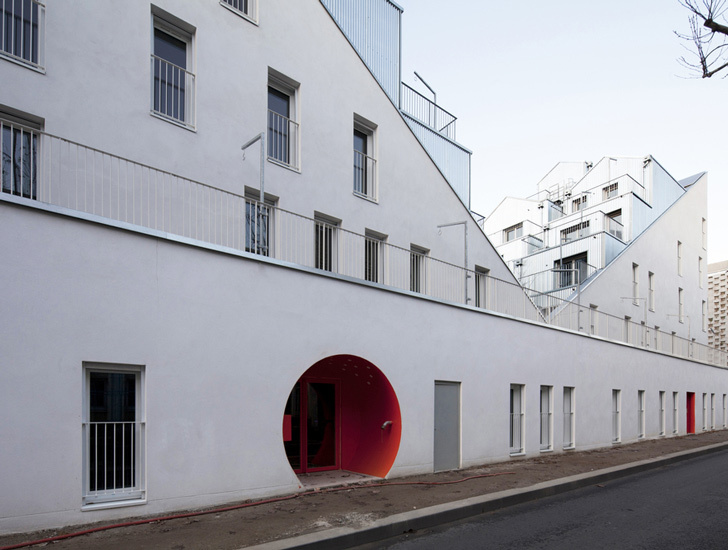 The M Building is a Parisian housing complex with a unique shape that emulates the alphabet letter. The housing development offers the experience of a village rather than an apartment block - each dwelling unit, set on a 45-degree angle, faces the stack of apartments on the other side, providing an intimate atmosphere for the occupants. 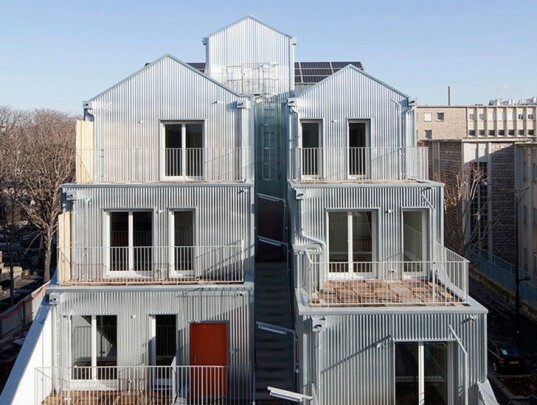 The generous porches and ample daylighting adds to the inviting nature of the design by Stéphane Maupin Architectes, which reimagines how social housing can adapt for a new urbanism. The two-toned building is placed on Rue Rebière, a narrow street in northern Paris, across from a graveyard which by code cannot have the building facing it. The design solves the conflict of providing air and light by looking inwards – it creates outdoor space and a commons by stepping the program onto itself. The orientation is such that morning light falls into one side of the complex and the other receives natural light in the afternoon. The building is capped with a solar electric array to supplement the electricity consumption of the 20 apartments. The openness of the design also avoids the monolithic quality of larger housing blocks, and the staggered, non-uniform apartments provide visual texture to the neighborhood. The building’s unique shape is further emphasized with a vanilla stucco exterior on the street side and vivid corrugated steel on the interior, providing a dual identity without expensive materials. The parquet wood terraces soften the metallic exterior, and a maze of simple steel railings demarcate each apartment’s patio. Paths across the building add routes of neighborly egress. The two-toned building is placed on Rue Rebière, a narrow street in northern Paris, across from a graveyard which by code cannot have the building facing it. The building is capped with a solar electric array to supplement the electricity consumption of the 20 apartments. The orientation is such that morning light falls into one side of the complex and the other receives natural light in the afternoon. The openness of the design also avoids the monolithic quality of larger housing blocks, and the staggered, non-uniform apartments provide visual texture to the neighborhood. The building’s unique shape is further emphasized with a vanilla stucco exterior on the street side and vivid corrugated steel on the interior, providing a dual identity without expensive materials. The parquet wood terraces soften the metallic exterior, and a maze of simple steel railings demarcate each apartment’s patio. Paths across the building add routes of neighborly egress.